What cuts better than blade steel? Razor blade steel. 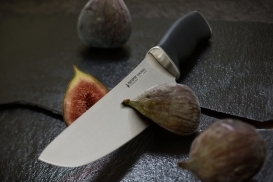 RESOLUTE is the first knife in the world with a blade made of razor blade steel. RESOLUTE achieves a unique edge retention of 59 â?" 60 Rockwell. The handle is discreet, ergonomically shaped and fits snugly in the hand. No power at all is needed to cut, due to the excellent balance of the knife. RESOLUTE is the â?oknife for lifeâ? for anyone attaching importance to a reliable, simply-designed but aesthetic knife for food preparation.